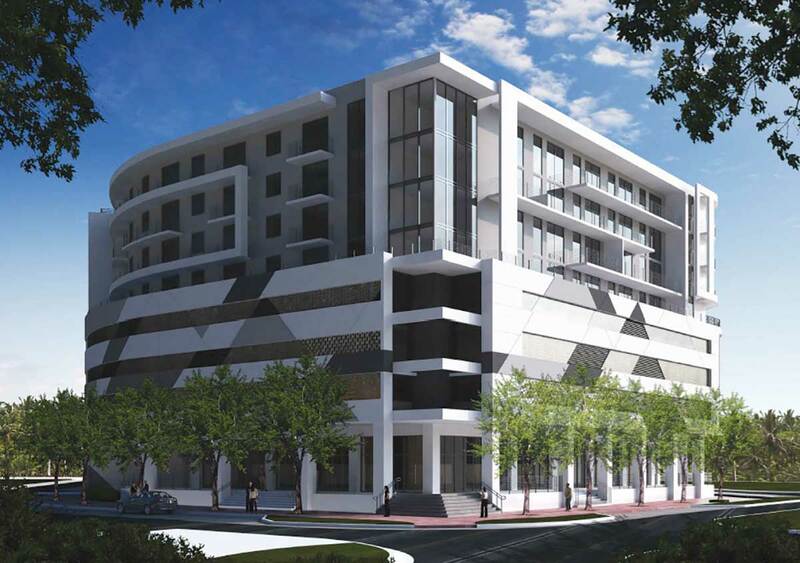 The developer who intends to bring new apartments to the edge of the Health District in Miami adjacent to the Dolphin Expressway has revised plans for a shorter building. In February, Spring Garden Apartments LLC received the Urban Development Review Board’s conditional approval for an 11-story mixed-use building at 1005 Spring Garden Road. Attorney Iris Escarra, representing the developer, had mentioned a possible plan to build at 8 stories instead. As part of its February approval vote, the board required the developer to return if the building design did go from 11 to 8 stories. At a special meeting March 29, the board approved the 8-story plan. Documents show the proposed height dropped from 125 feet to 95. The taller building included 250 dwellings and 394 parking spaces, and the 8-story building is to have 240 units and 274 parking spaces. The final plan also includes about 3,080 square feet of offices and 16,328 square feet of open space. In a letter about the project, Ms. Escarra said the site includes properties at 1005, 1015, 1025, 1033, 1073 and 1081 Spring Garden Road, 1200 NW 10th Ave., and 1000 and 1010 Sunnybrook Road. “The Property is located at the intersection of the Health District (formerly known as Civic Center) and the Overtown neighborhood of the City of Miami… areas which continue to experience rapid population growth and business expansion,” she wrote. The irregularly shaped site fronts Spring Garden Road to the south, Northwest 10th Avenue to the east, Sunnybrook Road to the north, and the State Road 836 (Dolphin) Expressway to the west. The site has a land use designation of Restricted Commercial. It’s surrounded by multi-family residential, office, and commercial uses. Ms. Escarra said the project will provide additional housing options within walking distance of one of the city’s most important employment and entertainment centers. “The Health District is home to the City’s principal health care, research, non-profit, educational and judicial institutions. This area is in great need of additional housing options to serve the thousands of individuals who work in the area,” she wrote. Soleste Uptown will provide spacious sidewalks and an arcade that will enhance the pedestrian experience in the area and give this long-neglected neighborhood a true sense of community, she said. Additionally, the project provides two fully activated cross-block passages. The first passage, along the northwest property line, will consist of an open area providing an inviting and serene environment with benches, lighting, landscaping, and other amenities including a dog park and providing a connection between Spring Garden Road and Sunnybrook Road, Ms. Escarra said. Plus, the project will provide a 10-foot-wide cross-block passage through the proposed structure that also provides seating areas, lighting and landscaping. ■Allowing up to a 30% parking reduction for properties within a half mile of a Transit Oriented Development. The property is about two blocks from the Culmer Metrorail Station. ■Allowing substitution of two residential loading berths for one commercial loading berth. ■Allowing up to a 10% reduction in the access aisle width. The project proposes a drive aisle width of 22 feet, instead of the required 23 feet. The project architect is Carmen T. Diaz of Caymart Design Inc.
As a condition of the board’s recommended approval, member Willy Bermello had asked that the designed metal screen façade be extended further. Mr. Bermello was absent March 29 but Ms. Escarra pointed out the new design does extend the metal screen façade along the secondary frontage as well as the primary. She noted the new design maintains the same volume in the lower levels as in the earlier plan. Ms. Escarra reminded the board that Soleste Uptown will nearly wrap around a public storage facility currently under construction. Board member Fidel Perez, who was not at the February meeting, said he had a problem with such a large building. “It goes block to block,” he said. Board members viewed renderings of the 11-story building next to the 8-story version. Mr. Perez said the previous design was better, as it helped to break up the volume. “The building is too long,” he said. Board member Ignacio Permuy had a different take. Mr. Marston agreed. The architect did a very good job and handled the design to 8 stories very successfully, and “without losing any character” of the building. Ms. Escarra had said the architect’s desire was a building at 11 stories, but “economics” played a role in the developer reducing the height. The 8-story project passed unanimously. Mr. Perez said even though he thinks the building is too long, he complimented the architect on the work, and voted yes as well. Great post! The taller building included 250 dwellings and 394 parking spaces, and the 8-story building is to have 240 units and 274 parking spaces.